Does being a voracious content consumer make women happy? As part of the POPSUGAR Insights "Find Your Happy" study, we asked women to tell us what types of lifestyle content they actively seek out in specific categories. First up is fashion content. 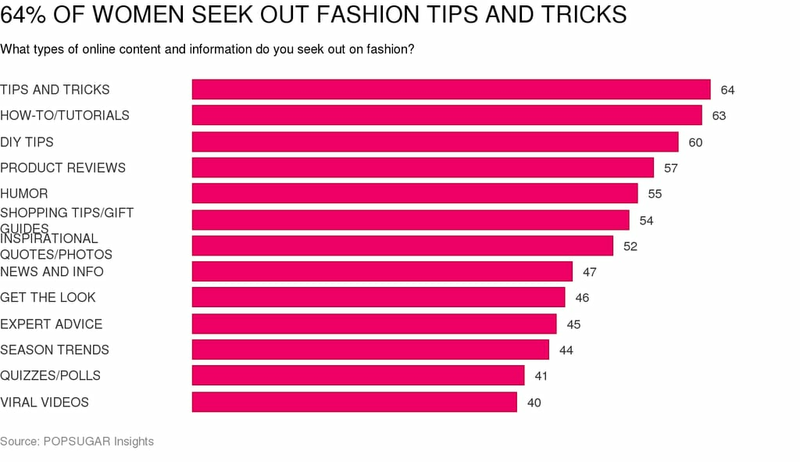 Overall, the most popular type of fashion content for women when they are seeking out information is tips and tricks (64%). A close second is how-to and tutorials (63%), followed by DIY tips (60%). Product reviews ranked fourth overall (57%), followed by humorous content (55%), shopping tips and gift guides (54%), and inspirational quotes or photos (52%). Learning and having fun were two trends that emerged for younger fashionistas with tutorials (73%), humorous content (65%), and inspirational quotes and photos (66%) all ranked higher by teen girls than adult women. Moms were more likely to seek out DIY content (64%) than any other female demographic. Hispanic women were more likely to seek out fashion news and information than other segments. Next, we wanted to ask women about the specific types of content they seek out when they are trying to learn or achieve something in fashion. This is a more purpose-driven type of content consumption and we noticed some interesting changes in the overall rankings. When seeking to learn something, women are equally likely to seek out how-to or tutorial content (60%) as tips and tricks (60%), followed closely by DIY tips (57%). Product reviews retain their position of fourth overall (53%), but shopping tips and gift guides (49%) gain a spot and "get the look" (48%), seasonal trend updates (48%), and expert advice (47%) all increase in importance.